Klondike Gift Shop on 3451 Route 59 in Bradford, Pennsylvania is located only minutes from the Allegheny National. The gift shop offers the area’s largest selection of T-shirts with a wide variety of designs to choose from, and many souvenirs and keepsakes. Gift items include mugs with local attractions, shot glasses, magnets, spoons, knives, jewelry, and toys for the little ones. Comfortable Moccasins, Indian pottery and Canadian soap stone carvings. 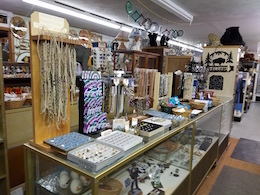 Other items include Austrian crystals, pewter figurines, wind chimes and genuine steer skulls decorated with pen and ink drawings. For the outdoor crowd Klondike Gift Shop offers topographic maps and camping supplies. Food and beverages include chilled soda, ice cream and other snacks. Please call 814-362-1788 for store hours or to make an appointment.